Martin objected to the abuse of indulgences; you can’t buy salvation. Though he mentioned the Church and the pope in some of his theses, he focused on the unbiblical excess of this one practice. In a creative, though misguided, fundraising effort, some church leaders began selling full indulgences. Through the purchase of indulgences, people could essentially purchase their salvation. They could also secure the eternal deliverance of others, both dead and alive. They could buy their way into heaven. The money raised was supposed to go to Rome to build the new Saint Peter’s Basilica (Church), replacing the old Saint Peter’s. It had stood over a millennium and reportedly served as the burial site for Jesus’s disciple Peter, also recognized as the first pope. Historians debate how much of the money collected actually made it back to Rome to help erect this shrine, but the promise of payment secured the permission to sell indulgences. The pope granted this authority to peddle eternal pardons to archbishop Albert of Brandenburg. Albert in turn tapped John Tetzel, among others, to carry this out. Tetzel pursued his assignment with much zeal. In the process, he earned Martin’s ire. In the years leading up to this approval to market indulgences, Church decisions began to depart from a biblical understanding of salvation. This became a slippery slope that made their latest ruling feasible. The Church headship at that time had become corrupt and greedy. Ambitious religious leaders no longer saw the papacy as a way to serve God and lead his people. Instead they viewed it as a means to live a life of luxury and wield unrestrained power. But Martin objected to the Church selling what Jesus died to give away with no strings attached. 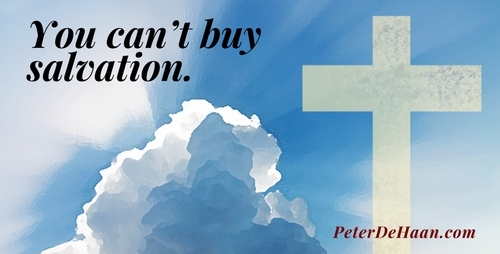 You can’t buy salvation. Martin’s main concern was that a full indulgence removed the need to repent to become right with God. Instead of professing remorse for sins, a person could pay a fee to secure their eternal reward. The price was often disproportionate to their economic condition. Beyond that, people could purchase the release into heaven for loved ones who had already died. They could also secure a future liberation for those still living. For these souls, their salvation happened without any action on their part. It wasn’t an act of personal repentance or their decision to purchase forgiveness. Martin advocated that we become living temples through our bodies instead of constructing church buildings. He placed Saint Peter’s as the least important of all Church structures. Martin may have considered Saint Peter’s Church last as a matter of hyperbole. However, as the costliest of Church facilities, he saw it as the biggest distraction to people from becoming living temples. He based this view on what he read in the Bible. Paul wrote that our bodies are temples for the Holy Spirit (1 Corinthians 6:19), and we’re built on the foundation formed by the apostles and prophets, with Jesus as our chief cornerstone (Ephesians 2:20). Ironically, Peter—for whom the building was named—wrote that we are like living stones, which are being built into God’s spiritual house (1 Peter 2:5). Martin also noted that the wealthy pope already had enough money to finance the new Saint Peter’s Basilica. He had no reason—other than greed—to approve a fundraising campaign. Yet by him granting authority to Albert to sell indulgences, even more money could pour into the Church’s treasury. This essentially grew the pope’s personal wealth. Martin provided a voice for their simmering angst. This message resonated with the German people. They had suffered under the corruption of Church leadership and felt the Church in Rome overlooked their plight in Germany. They also rankled under Martin’s revelation that they had wasted money to purchase indulgences. He said the certificates they received held no value, either in this world or the next. But Martin had more to say…to be continued. This is from Peter DeHaan’s book 95 Tweets: Celebrating Martin Luther in the 21st Century. Buy it today to discover more about Martin Luther and his history-changing 95 theses.